London, UK (BBN)-Harry Potter fans have given a new play about JK Rowling’s famous wizard an ecstatic reception. Hundreds of fans stood and cheered as the first part of Harry Potter and the Cursed Child came to a dramatic close at London’s Palace Theatre, reports BBC. As the 1,500 audience members left the show they were given badges asking them to “keep the secrets”. Earlier they had queued around the block – many dressed as witches and wizards – as they waited to clear the strict security in place at the theatre. The Cursed Child plot digs deep into the world presented in the Potter novels and involves an artefact from Harry’s past. 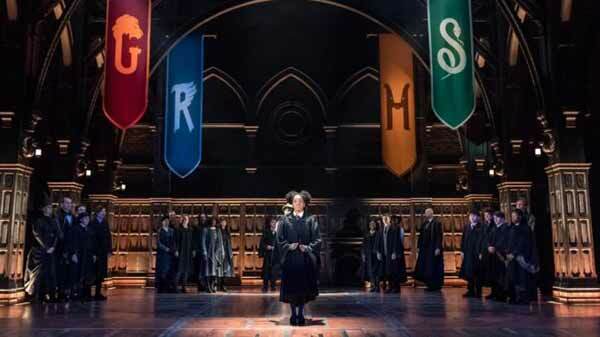 Tuesday night’s preview marked the first time a Harry Potter story has been presented on stage. Part two will get its first outing on Thursday night. The show doesn’t have its official opening until 30 July. Picking up from where the Deathly Hallows epilogue left off, it portrays Harry, played by Jamie Parker, as an “over-worked” employee at the Ministry of Magic. His youngest son Albus (Sam Clemmett) has to deal with the “heavy burden” of the Potter family legacy. Other characters include Hermione Granger (Noma Dumezweni), Ron Weasley (Paul Thornley), their daughter Rose (Cherrelle Skeete), Ginny Potter (Poppy Miller), Draco Malfoy (Alex Price). Earlier, Rowling had tweeted a good luck message to Anthony Boyle, who plays Draco’s son, Scorpius. When tickets went on sale last October the first 175,000 sold within 24 hours. The script is already topping bestseller lists, although it won’t be published until after the play’s official opening on 30 July.